It just occurred to me how well cubicles would fit on a tabletop grid. Or waiting 6 YEARS for a raise - and when your boss finally gives you one, he says it's taken so long because your performance has been shaky, when the reason it's been so shaky is working that long WITH NO SIGN OF A RAISE. Yes, it always helps to speak a language the listener understands! 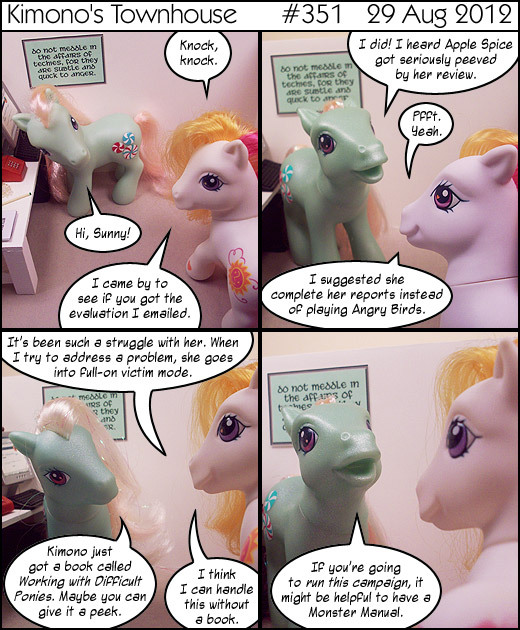 LOL... Minty is actually quite insightful sometimes.